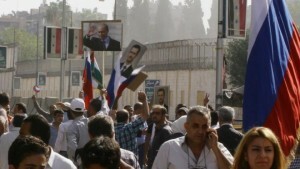 Two shells have struck the Russian embassy compound in the Syrian capital Damascus as hundreds of pro-government supporters rallied outside in support of Russian air strikes. A BBC Arabic correspondent in Damascus says some people have been injured. The explosions triggered widespread panic and smoke was seen coming from the embassy compound. He said those responsible were trying to “intimidate those fighting Islamic State”. In another development on Tuesday, a report by Amnesty International accused Kurdish forces in northern Syria of carrying out a wave of forced displacements and mass house demolitions that amounted to war crimes. It said the Popular Protection Units (YPG) had razed entire villages after capturing them from IS. The YPG has consistently denied accusations of forced displacements. Activist group the Syrian Observatory for Human Rights said the shells fired at the embassy had come from an eastern area of the capital. Moments before, demonstrators had been waving Russian flags and holding up photographs of Russian President Vladimir Putin, witnesses said. Media player helpOut of media player. Press enter to return or tab to continue. What can Russia’s air force do? The US-led coalition has failed to destroy IS. Can Russia do any better? Rebel forces based in the suburbs of Damascus have previously targeted the embassy. Last month, Russia demanded “concrete action” after a missile struck the embassy compound. One person was killed in May when mortar rounds landed near the embassy, and three people were hurt in April when mortars exploded inside the compound. Russia began its campaign of air strikes in Syria late last month. The Kremlin says it is attacking the Islamic State (IS) group and other jihadists, but the US says other rebel groups opposed to President Bashar al-Assad – an ally of Russia – have been targeted. The Russian offensive has allowed pro-government forces to regain ground they had lost to rebel groups. On Monday, the head of the al-Nusra Front – a branch of al-Qaeda in Syria – described Russia’s intervention as “a new crusade”. Abu Mohammad al-Golani called on rebel groups to unite in the wake of the air strikes and also urged Muslims in the Russian Caucasus to attack civilians there. 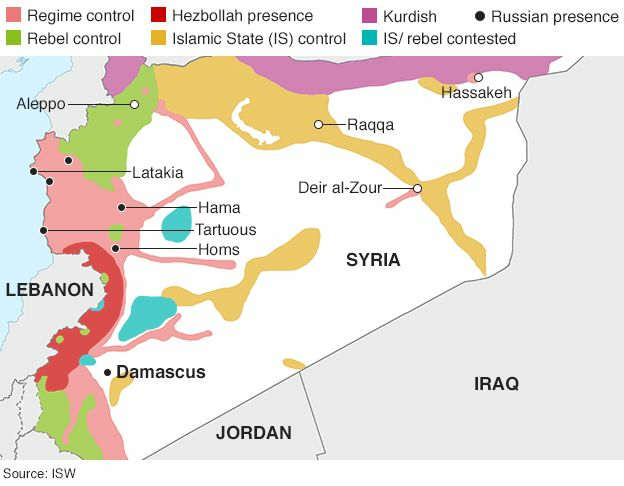 The Russian attacks have concentrated on areas in north-western Syria where al-Nusra has a powerful presence.